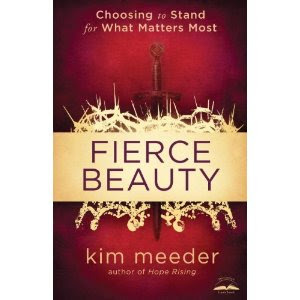 I only just finished reading Kim Meeder's book Fierce Beauty this morning and I stand amazed, my sword in hand. This was not just a small 182 page book about seeing yourself as a beautiful person. It was a book that taught about being beauty in this world...becoming a beautiful vessel for our living God. These pages held many truths and lessons, simplistic and the-harder-ones-to-learn about how to truly live beautifully for Him and in such a way for others to glimpse that beauty within us daily. Meeder speaks through her many life experiences, adventures, trials, sufferings, joys and even the animals in her life, wild and domesticated, to speak boldly about what it means to choose to stand for what matters most. And what matters most in this world is to take a stand, living courageously and beautifully for Him. From snakes to sea turtles and from scary mountainsides to skiing for her life at all costs Meeder's stories are engaging, humorous and insightful. I thoroughly enjoyed how poetically she wrote throughout the whole book, and I also adored how every chapter told a chapter of the author's own life and then at the end of each chapter everything was neatly wrapped up with a small chapter and word from the heart of God. If you are a lover of The King and of animals then this book is for you. If you are seeking to live a life of beauty that is not about how you look then this book is for you. If you are struggling with an untimely death, thoughts of suicide, anorexia/bulimia or learning to possess a heart of forgiveness then this book, my friend, is indeed written for you. Please rank my review of this book below! Thanks. i must read this book now!! I'm pretty sure you'll adore this book, Rachel! Happy reading, dear!! Oh wow sounds like a really encouraging book!!! Maybe I'll request it as my next book review! The book I'm reading now just isn't what I was needing! It really was, Mere. Which book have you been reading?